Have we all become too sensitive and too damn politically correct? 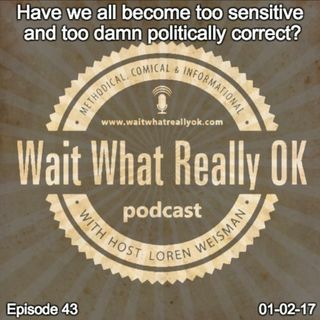 Wait What Really OK Podcast Episode 43 hosted by Brand Precision Marketing Strategist and Counselor, Loren Weisman talks with Dominic DiGiorgio about how easily offended everyone has become these days and how it is hurting more than helping. And to be clear, it is not about not being respectful… We are talking about how it is impossible not to offend someone these days. Dominic DiGiorgio AKA “Dom The Coffee ... Más informaciones Guy” and Loren Weisman dig in to this over sensitive world of PC. There is a fine line between being honest and being disrespectful. And unfortunately with many people not knowing the difference, they are feeling offended by anything and everything. "Being offended is subjective. Whats wrong with being offended?“ - Steve Hughes. Podcast Blog Supplement for Episode 43 of the Wait What Really OK Podcast with Loren Weisman. Podcast Link Supplement for Episode 43 of the Wait What Really OK Podcast with Loren Weisman. How do you engage and network at trade shows and trade expos? Podcast Video Supplement for Episode 43 of the Wait What Really OK Podcast with Loren Weisman. Podcast Photo Supplement for Episode 43 of the Wait What Really OK Podcast with Loren Weisman.